When it comes to picking and displaying artwork in your home, many people can feel paralyzed. We know adding in art brings a warm finishing touch to the space, but how do you know what art to pick? There are so many colors, patterns and styles to mix together that it often can be overwhelming. Today I am sharing my tips on How to Mix and Match Artwork in your home. 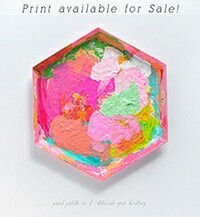 Today’s post is sponsored by Minted. All opinions are 100% mine. The first thing to tackle when you are looking to mix and match artwork in your home is what style is the room that you will be adding the art to? 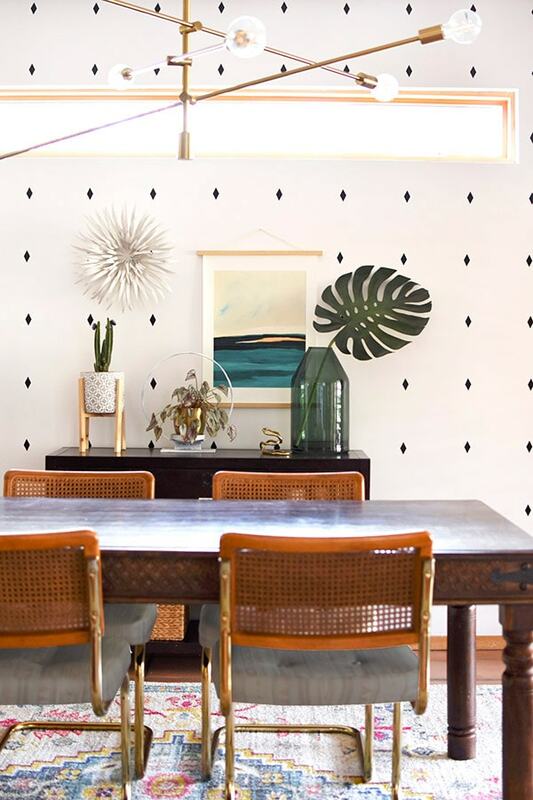 The feel I wanted my dining room to have was an Eclectic Modern Southwest vibe (that’s a mouthful – ha). My nearby living room leans more towards neutrals, so my dining room was a great opportunity to still speak to those same neutral colors but turn up the excitement a bit. And I knew I could do that with the art I choose. 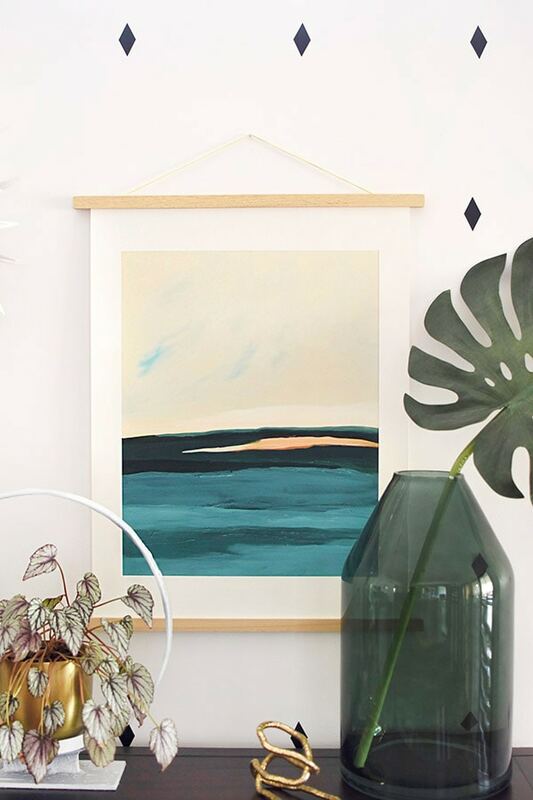 I loved how this Hawaiian Reef painting although an abstract of water still evokes an organic landscape feel, which ties into my Modern Southwest feeling for the room. Every room in your home should tell a story or give off a mood. Once you have nailed down the feel of the room, you can start to think of words that would describe it. Is it exciting and colorful, or calm and moody? Putting words to the room, will help you later on as you start looking at art. 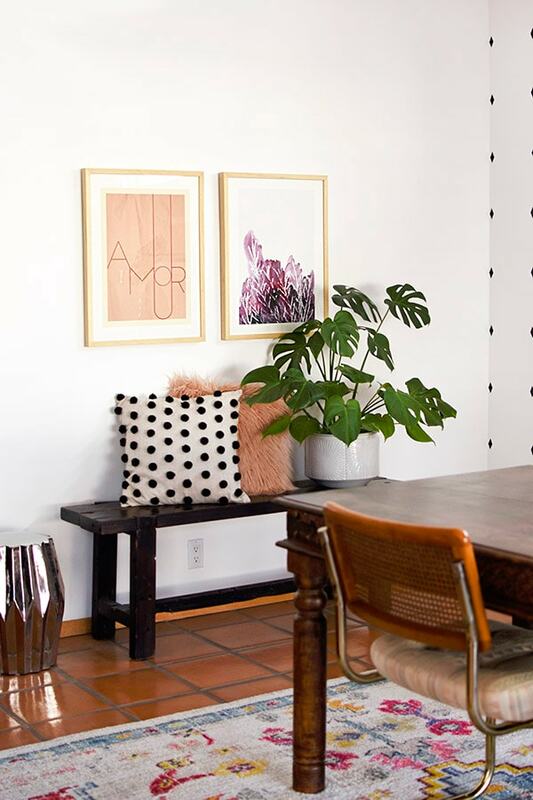 Also, having more than one word to describe your space is helpful because you can mix different styles of art on a wall, if they both have a similar mood or style that is linking them together. 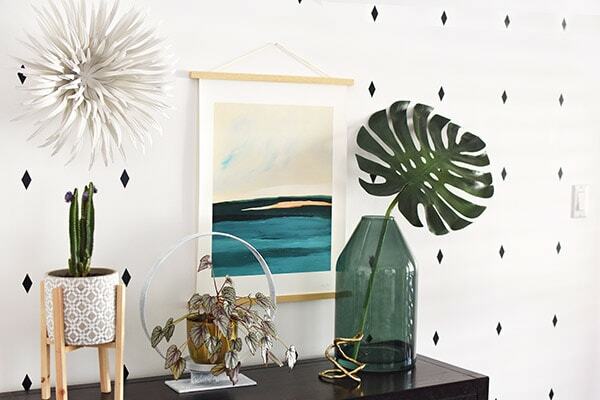 The second thing to consider when you are looking to mix and match artwork in your home is what do you want the connecting element to be? There can be many different ways to connect your art. You can select artwork that is all the same color palette, uses similar patterns, is made of the same material, or even just of a similar subject matter. And the best thing is, this is YOUR home and you get to decided! For my dining room, I knew I wanted my art to pull color from my new rug. So, I was keeping my eye open for artwork in pinks, blush, creams and jewel tones. Another way to do this concept is to use the same color throughout your art. This creates a very cohesive grouping. 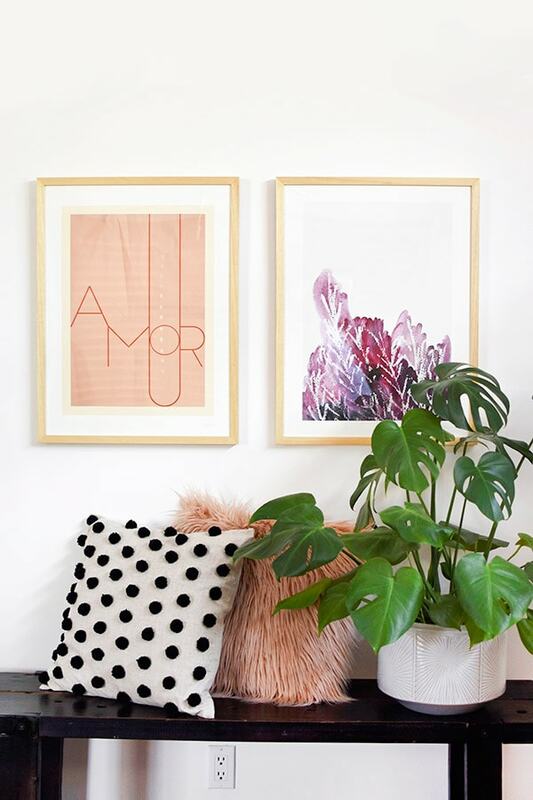 I choose to combine the artwork by color and I fell in love with the Amour, the Shubbery and the Hawaiian Reef Wall prints for this very reason. Another simple way to mix and match art is to choose pieces based on patterns. I have always been a fan of bold graphic patterns and mixing in graphic patterns with one more organic pattern can still be very successful. 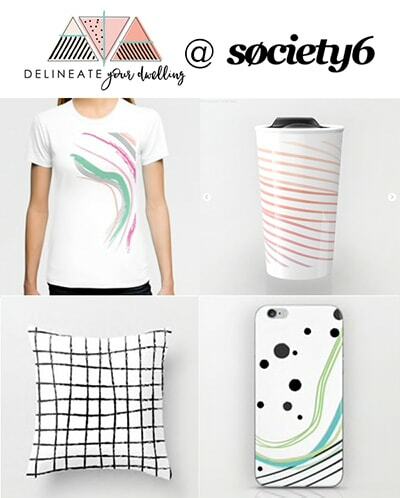 The key factor in this pairing is that there is some type of pattern in your art. You could also mix and match art in your home by subject matter. An entire wall or room filled with portraits, maps, calming ocean scenes, sketchy fashion images, etc… is a fun way to group art. It can really make a bold statement instead of a more “collected” look throughout the house. It is also the perfect way to display art that is reminiscent of your hobbies, interests, or personal preferences. Nothing gets the point across more than a large art grouping of a similar subject. The third thing to consider when you are looking to mix and match artwork in your home is does this collection of art make sense in your space? Sometimes you can follow all the above tips for creating a cohesive collection of art and when you step back and look at them all together… something is off. Maybe one piece just doesn’t belong? I kept trying to include pieces from Minted with greenery and plants in them because I LOVE plants. I am very drawn to images of cactus and leaves but when I looked at my overall space, I had three real plants in there and adding plants in my artwork would have just been too much. So being able to step back and look at your overall room is a very helpful tip. 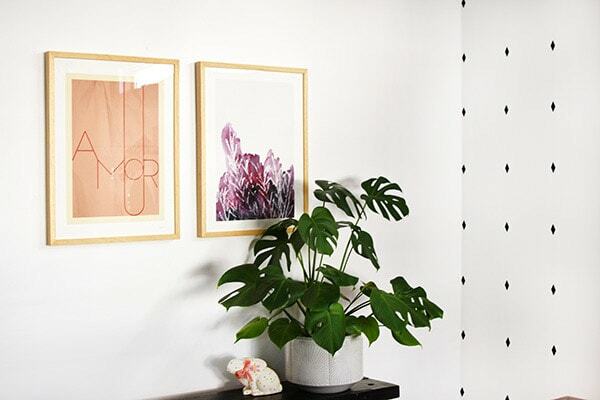 I removed the plant image that I had put in my Minted cart and replaced it with the Blush Amour piece. It was the perfect replacement! Thank you to Minted for providing the artwork in this post. I love supporting companies that encourage Independent Artists! Did I mention I had a HGTV Magazine Dining Room Feature of this room??!!!! MY Home –> Want to check out my each room in my home? I have shared inspiration, tips and inexpensive ways to make your home YOU.